Hi friends! Today was the day of my CT Scan. Sadly, the techs wouldn't tell me anything but hopefully I'll hear from my doctor soon. The pain is getting progressively worse. I'm not sure what that means. But hopefully answers and relief are coming. Thanks again for all the well wishes, they mean a lot to me! Here's a card I made for a call that wasn't picked up. I'm pretty bummed about this one because I think the stamp is just SOOOO cute. The stamps come from My Thoughts Exactly. 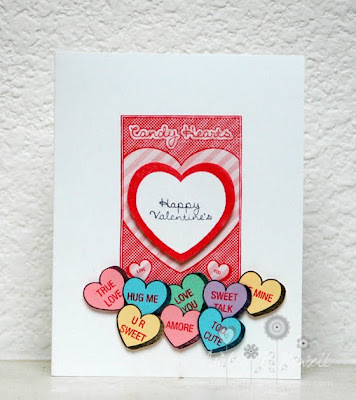 I used Candy Hearts, Candy Hearts Add on 1, Candy Hearts Add on 2, Candy Hearts Add on 3, and Love Label. I made a clean card because I wanted the stamps to shine. And though it's pretty clean, a lot of work went into stamping and cutting. The paper is Echo Park. Good thoughts and vibes your way, Missy!!! Hope everything will turn out ok! Cute card!! Love those stamps! This is such a fun stamp set and a great card. So sorry to hear that things aren't getting better. Hopefully when you meet with the doc you'll get something more definitive! Oh this is adorable!! Love those little candy hearts!